I bring: more pictures. Because it is a snow day and I've yet to even change out of my pajamas. There really couldn't be a better time for me to update. I feel very close to you all after witnessing the dance attire of the last entry together. And I bring better news this time. Seriously, doesn't this cover just embody the spirit of the whole series? 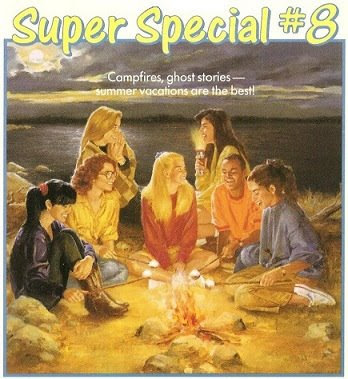 Girls around a campfire staring lovingly at each other, holding flashlights under their faces, toasting marshmallows, and wearing some extremely intense American Apparel-style glasses frames? Plus, for once they are all drawn fairly true to what they looked like (in my ten year old mind, anyway). Sure, Dawn's hair still isn't nearly long enough, but at least it's not the same damn shade/style as Stacey's. And of course, they all look approximately 27 years old. With that said, can we talk about Claudia? Because I feel like I see this outfit on my campus everyday. Minus the side ponytail, that is. 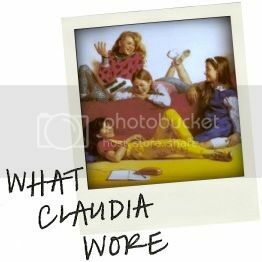 I'm starting to think that Claudia was actually some sort of bizarre idiot savant who secretly constructed a time machine and spent a lot of time checking in on 2007/2008. I almost kind of love the cowboy boots. I don't think I could rock them, but our heroine is totally pulling them off. Thoughts on the other ladies: Now, I'm a big fan of mustard yellow. However. What the hell is Stacey wearing? Why did she think yellow gold was a good jewelry choice? Sam spends the entire book pining after this? Surprisingly, I'm totally behind Mallory's outfit choice. I don't know why, I just am. I think it's those damn big glasses. They somehow make the safari-reminiscent double breasted shirt okay. With the right pair of shoes (I would probably want to tuck the jeans into some campus boots, but that's me) this could somehow be a good outfit. I find myself quite bemused by the whole thing. The only other sitter worth noting is Kristy, because she is also surprising me by being almost adorably cute. I always picture her in baggy, ill-fitting stuff, jeans with the bottoms rolled up (why did the illustrators rely so much on that detail? It looked horrible!) and turtlenecks with lots of pills. She is practically L.L. Bean ready in her little preppy sneakers and khakis! Cutie. And now for some text. Stacey was wearing a simple (for her) outfit - black leggings [there they are again. Say it with me now: leggings are not pants. Except if Claudia wears them. I'm cool with that. ], a long black t-shirt with brilliant [I know she means colorful but I prefer to imagine that the starfishes' SAT results were printed on the back of the shirt] starfish swooping across the front, black flop socks, and high-tops. 'Yeah, but I look good,' she replied [up for debate, sweetheart], and everyone laughed. Sometimes Stacey says things like that just to annoy me, since I couldn't care less about clothes." They're all out to get you, Kristy. "It's four o'clock," said Claudia. "The dance begins at eight." "Yikes!" I cried. I sat up fast. "Boy, do we have a lot to do." "Thank goodness we don't have to get too dressed up," I said. Oh really? Then why do you need four hours? I can't be alone in thinking this is a totally irrational amount of time to spend preparing for a dance in a lodge with a bunch of vacationing families. Even for these two. Oh! By the way, while packing for the babysitters' overnight on Shadow Island, Dawn calls out Claudia for packing her makeup. I think this book takes place not too long after Dawn's Big Date. Maybe she's still bitter. 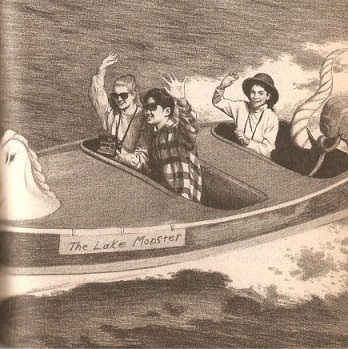 And finally, I would like to close with another illustration, presented as further evidence of my time machine theory. She's wearing buffalo plaid and Ray-Ban sunglasses. Somebody's been reading a lot of Nylon.